It was the best of places it was the worst of places, somewhere everyone said they had fun, somewhere others said everyone sinned; it was close enough to town you could count on meeting friends, it was far enough away from town hopefully no one would recognize you; it was a legal business routinely caught breaking the law; loved and hated, tolerated and intolerable, it was any of the hundred-plus Sonoma County roadhouses in the early Twentieth Century. Up to this point roadhouses have been peripheral to issues explored in this journal. Women weren't allowed to drink liquor or even enter a saloon so it was an interesting news item in 1907 when a roadhouse in the Sonoma Valley was closed after a party of men and women were spotted drinking together and cussing. Some places were also shut down for selling alcohol to Indians because under the strict 1908 county law there was a fine of $500 and six months in jail for selling booze to anyone with just one-fourth Native American blood. And in 1912, the sheriff raided a Fulton roadhouse because they were holding a dance where hipsters were breaking out those new, obscene "ragtime" dance steps. Roadhouses were more than a saloon in the country. Sometimes they had a few bedrooms and it was claimed to be a hotel; sometimes food was served and the place called itself a restaurant, even if the only thing on the menu was a plate of saltine crackers (a couple of dives in Santa Rosa were busted in 1907 for serving up such a "meal"). But usually there was no pretense about the place; it could be an old farmhouse or shack, with a flat wooden board for a bartop, a few tables and chairs - and a liquor license. Around 1910 most Americans probably lived only a few minutes away from a roadhouse (and maybe more than one) but that was nothing new. Here in Sonoma County, the 1877 county atlas shows three places a farmer could wet his whistle between Sebastopol and Santa Rosa and at least two were between Petaluma and Cotati, the most famous being Washoe House. Being in the county, these were little fiefdoms ruled by the will and whim of the proprietor. Did saloons in town have to be closed on Sundays? Thirsty men could head out to the roadhouse, which was nearly always open. "Ragging" was outlawed in Petaluma in 1912 and Santa Rosa was under pressure to ban it as well, but there were no prudish rules about close contact dancing at the roadhouse (while there was no country ordinance against dancing, the deputy in Fulton apparently believed there was other monkey business afoot). From at least 1910 on, the roadhouse and its offshoots take more of a central role in Sonoma County history. Some of the reasons were unique to where we are and who we were; some were more in common with other places in America. Certainly the advent of automobiles brought more traffic to roadhouses everywhere, but in Sonoma County we shouldn't make too much of it. At the time there was a popular electric trolley connecting all of central county as well as light rail going down the Sonoma Valley. There was probably a roadhouse only a few steps away from every rural train platform. And that's not even considering the booming playland along the Russian River which began to emerge after 1910, when the railway coming up the coast from San Francisco finally connected with the little train that rattled along the river. Every year new places popped up, making it a nearly continuous party scene. It would not be surprising to discover most money coming into the county by 1940 was tied directly to drinking and dancing along River Road. Roadhouses always had a reputation for skirting the law, which was part of their rough appeal. Yes, there were arrests for selling liquor to Indians and women (plus allowing them inside) and come the years of Prohibition there was no better possible training for running a speakeasy than having owned a roadhouse. But increasingly activities in the unincorporated parts of Sonoma County would be tied to more serious crimes, including prostitution. And Santa Rosa may be to blame for some of that. As longtime readers know, Santa Rosa had a major tenderloin district around the intersection of First and D streets, with at least a dozen houses operating. The city curbed prostitution somewhat in 1909, forcing the bordellos to be more discreet about their business and apparently pushing some of the traffic out into the countryside (MORE BACKGROUND). Soon after the crackdown a pair of "brothel agents" were arrested in El Verano, where they were apparently planning to setup a house. A few years later, a large bordello outside of Sebastopol was raided and closed. Never before had the Santa Rosa newspapers mentioned problems with prostitution in rural areas. There are so many saloons and road houses there that the district has become notorious. Much of the indignation aroused has been occasioned by the fact that practically every resort of this character is located right on the main county road, where it and the conditions it creates are constantly flaunted in the faces of the passers-by. Most of these places do not even have an excuse for existence, but are road-houses and nothing else...Present conditions in the beautiful Sonoma valley should never have been allowed to develop. Not all, but most of the road-houses there are cheap, unattractive places that have been established in the near vicinity of popular summer resorts in the hope of diverting trade that rightfully belongs to the institutions upon which they hoped to prey like leeches, they live off the blood created and furnished by somebody else. 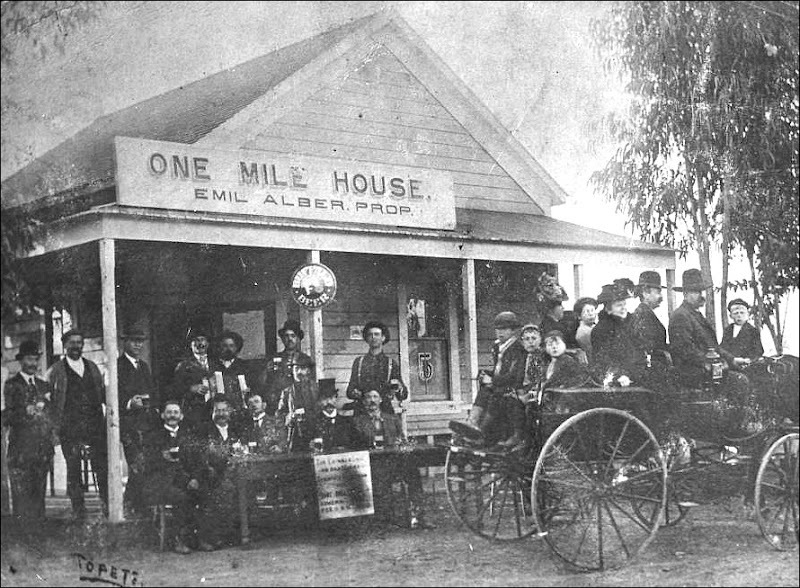 The number of saloons and road-houses in the Sonoma valley is out of all reason. No self-respecting community could be expected to continue forever to put up with conditions such as exist there. That led to the county trying to kill the roadhouses outright (or at least seriously hobble them), which created a political mess that will be unpeeled here later. Next, however, we're going to lurch forward more than twenty years to look at the aftermath of all this in El Verano, with the long residence of infamous madam "Spanish Kitty" and Sonoma County's claim to gangster fame with the stopover of trigger-happy Baby Face Nelson. "Resolved, That no new or additional liquor licenses he issued for such business in either of said precincts, also that no license for any new saloon be granted until the number of saloons in said precincts become less than twelve, and that the number of such licenses be limited to twelve for both such precincts. "It is also the sense of this Board that the ordinances governing the sale of liquor and the conduct of saloons be rigidly enforced, and that for the first offense a fine sufficient to have a deterrent effect be imposed, and for the second offense, in addition to any fine, this Board revoke the license of the offender." At the meeting of the Board of Supervisors on Monday the Board was asked to adopt the above resolution, and the desire to have all the members of the board present when action was taken, resulted in its being deferred for that purpose. It is practically certain that the Supervisors will grant the prayer of the petitioners. Under the circumstances, it would seem that the relief asked for should come from the Board of Supervisors, who have the right to revoke as well as to grant the licenses under which these places are conducted closing up the objectionable road-houses and enforcing strict regulation of those resorts that are allowed to continue in business would probably remove all just cause for complaint, and at the same time it would allow the fairminded people of the valley a dignified way out of the perplexing situation which now confronts them. That the residents of Sonoma Valley have just cause for complaint, no reasonable person can deny. There are so many saloons and road houses there that the district has become notorious. Much of the indignation aroused has been occasioned by the fact that practically every resort of this character is located right on the main county road, where it and the conditions it creates are constantly flaunted in the faces of the passers-by. Most of these places do not even have an excuse for existence, but are road-houses and nothing else. Others are part of reputable and well-established summer resorts--the kind that represent large investments and really attract people to such a community during the summer time. Comparatively few people have any serious objection to a resort of this character being allowed to conduct a bar or club-house in connection provided the same be properly managed and its existence not unduly emphasized. Present conditions in the beautiful Sonoma valley should never have been allowed to develop. Not all, but most of the road-houses there are cheap, unattractive places that have been established in the near vicinity of popular summer resorts in the hope of diverting trade that rightfully belongs to the institutions upon which they hoped to prey like leeches, they live off the blood created and furnished by somebody else. The number of saloons and road-houses in the Sonoma valley is out of all reason. No self-respecting community could be expected to continue forever to put up with conditions such as exist there. The Board of Supervisors more than anybody else are responsible for these conditions, which have developed gradually and perhaps without full realization upon anyone's part of the ultimate consequences. The time has now come when there must be a change. This can be accomplished without any of the bitterness that is invariably engendered by a hard-fought prohibition campaign--a struggle that arrays neighbor against neighbor, friend against friend, brother against brother. The authorities responsible should remedy the conditions complained of, and at once. It will not do to merely adopt "resolutions of intention." ...I have lived here for almost a quarter of a century, and have friends and neighbors in both factions. On both sides are bad and good arguments. Let us consider some of these from a financial and moral standpoint. First the financial: Up to about ten years ago this valley was dead. Land near Sonoma, El Verano and along the valley could hardly be sold at any price; settlers were few and far between. Within the last decade there has been a great increase in population and real estate values. In the last five years Sonoma has forged ahead more than it did in the twenty-five previous years--with her court house, the water, light and sewer systems. The valley has also good electric light and telephone systems. What brought all this prosperity to the valley? The summer people. ...This valley is emphatically a summer resort and dependent on that alone for its prosperity. It creates a demand for hotels, such as Boyes, Fetters, Richards and the many other hotels throughout the valley; it creates a demand for small holdings for summer homes; it creates a home market for farm products; hence the demand for small farms and the rise in real estate values. The land, which could not be sold for $100 an acre, in selling fast now for $250 an acre. 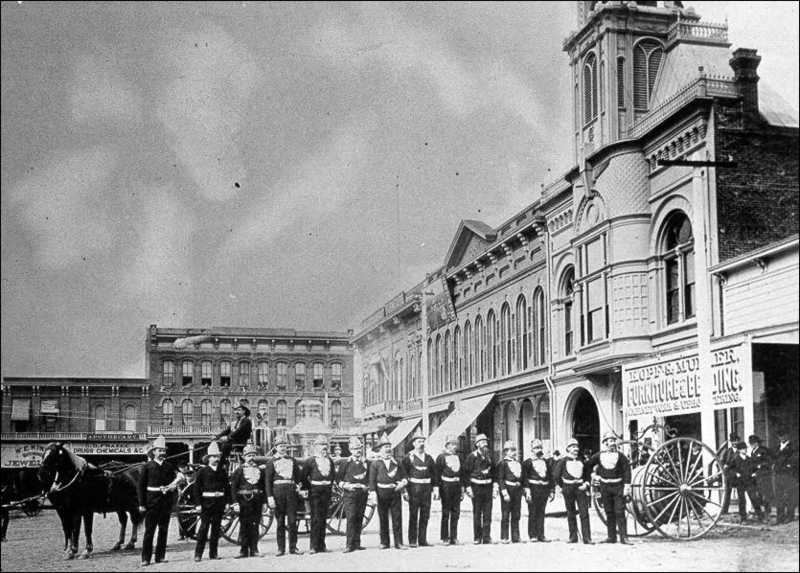 Santa Rosa would probably burn down if they didn't start a fire company, but many didn't seem to care if it did in 1860. This is the story of the origins of the Santa Rosa Fire Department, but you could easily say it's also about the origins of Santa Rosa as a community. In 1860 the town proper had only about 500 residents and it was very much an I've-got-mine kind of place. There was no public school in town until the year before; why tax yourself to educate someone else's kids? Or why worry about your house catching fire since you're personally always careful with lamps and candles? An attempt to start a volunteer fire company flopped in 1858 because it was presumed fire-fighting equipment might cost too much. "We must have some kind of fire organization," the Sonoma County Democrat begged. "Santa Rosa is composed almost entirely of wooden buildings, and if a fire should break out in any part of the town, in all probability the whole place would be laid in ashes." Not so lucky was the town of Healdsburg, where most of the business district was destroyed a few days later, even though residents tried to make a firebreak by blowing up the cigar store. "Every effort was made on the part of the citizens to suppress the flames, but owing to their having no fire organization all their efforts were of no avail," the Democrat commented, again jabbing Santa Rosa with an editorial elbow. Still, nothing was done. The Democrat coverage of those fires was fairly lengthy, considering they occurred in the autumn of 1860 just before the presidential election. Editor Thomas Thompson was squeezing out almost all local news to make space for tirades against for voting for Lincoln, denouncing him as a coward, fool and abolitionist who - horrors, the unthinkable! - was secretly planning to free the slaves once he sneaked into the White House. How it must have galled Thompson to waste those column inches to chide citizens over the importance of fire protection when the precious space surely would have been better used promoting Breckinridge, the candidate upholding the absolute legal right of slavery in the South. The turning point came in the new year when Dr. Todd's home on Third street caught fire. It burned with remarkable speed; only by good fortune was a toddler rescued from being trapped inside. The flames lept to the house next door (home to Joel Miller and family, known to readers via the Otho Hinton story) and threatened the building just beyond that, which was the office of the Sonoma County Democrat. Only the doctor's home was lost and only thanks to an absence of wind. Coming so soon after the devastation in Healdsburg, it was no longer a challenge to convince our penny-pinching ancestors that something must be done for the sake of the common good. In just a couple of days, Dr. Alban raised over $300 for the purchase of equipment and at the end of the week, meeting above Fen's Saloon at the corner of Third and Main streets, 25 men signed up to form Santa Rosa's first hook and ladder company. The date was February 2nd, 1861. A committee went to San Francisco and found the fire department there had a used engine made by the Hunneman company. An agreement was made: $400 down and three men in town signed a promissory note for the $900 balance. The engine arrived in mid-December. "The 'boys' tried her on Monday afternoon," the Democrat reported, "and rendered a verdict in consequence in perfect accordance with her name - 'Cataract.'" Then they apparently adjourned to the room above Fen's Saloon. The engine and a two-wheeled hose carriage arrive at the fire, drawn by horses (which in itself was an innovation in the mid 19th century). The first job is to fill up the "tub;" Santa Rosa's engine probably held about 200 gallons so a leather hose is hooked up to a fire hydrant, if available, or dropped into a well. Copper nozzles are screwed on to one or both leather hoses attached to spigots on the sides. Firemen take positions holding the two long brass poles on either side of the engine which are called "brakes" (a 18th-19th century name for the handle of a pump) and begin seesawing them like mad. You can watch a video here. Inside the engine, those brakes are operating a two cylinder single acting piston pump. There is also a copper air chamber to produce a steady flow of water but as pressure builds up, the increased resistance makes it harder to pump. Firemen can only work for a few minutes without tiring, requiring them to work in teams. More details of the workings can be found at the New Boston Historical Society. Note particularly the engine has no "engine" - no steam or other form of power except fireman muscle, and lots of it. It's a tribute to Hunneman's design and craftsmanship that the things performed so well; even the smaller model, as seen here, had enough pressure to shoot a stream nearly 200 feet in competitions held elsewhere. The company showed off the "bully Cataract" at a Sonoma mechanical fair later that year but didn't expect to win any prizes because "our machine is of much less capacity than any engine in the district," as commented the Democrat. The provenance of Santa Rosa's Cataract is fuzzy. There are aficionados who seek to track down the history of every "hand tub" (particularly the Hunnemans), but this one seems to have slipped through the cracks. The Sonoma County Democrat mentioned "the engine has 'seen service' in the East, but not enough to injure it," and according to another paper we bought it off of San Francisco's Howard Engine Company No. 3, but there is no further genealogy. Possibly San Francisco sold it quickly because it was not as the East Coast seller advertised; with even the smallest model weighing nearly a ton and all shipping to and from the East sailing around the Horn, returns were not as easy as sending a defective gizmo back to Amazon. The first real challenge for the Santa Rosa company came four months later, at the end of April, 1862 when the Eureka Hotel caught fire. "The flames spread so rapidly through the building that many boarders barely escaped with their lives," the Democrat reported, "and some made their appearance in the street minus 'unmentionables.'" The hotel was lost along with an adjoining store, the fire being uncontrolled in part because of an unreliable water supply; their engine drained four wells and its hose was working on the fifth well at the end, the paper noting that moving the hose from well to well cost considerable time. But members of the company bonded over the experience and nearly twenty years later they were still talking about it: "...To hear the old members speak of the excitement and daring of their comrades in vying with one another for bravery and the labor of gaining control of the fiery element, recalls vividly the pioneer days of raging conflagrations in San Francisco." Their company motto, "Faithful and Fearless" spoke to this pride. Members of the company were all unpaid, but volunteering was not without its perks. They were exempt from jury duty and militia service - the latter being a particular draw after Congress passed the 1863 conscription act. While California was never required to send a quota to fight for the Union, the pro-Confederacy young men of Santa Rosa probably didn't want to take chances. Since the town contributed nothing for equipment or to help retire the amount still owed on the engine, the "ladies" - none of whom were ever named - held annual Firemen's Balls. The first one in early 1862 was a complete bust so they hit the reset button and held another first annual ball in the summer. That one raised $35, which the company used to buy a "triangle" for sounding the alarm. Aside from the Fourth of July festivities, these Firemen's Balls were the only major events in town not hosted by a church. A description is transcribed below, with dancing continuing until 4AM and a break at midnight for everyone to have supper. In a town where rancor over the Civil War ran high (Lincoln received only 18 percent of the vote in Santa Rosa, by far the lowest in the county), these benefits offered a unique, nonpartisan gathering for the whole community. A crisis came in 1863 because $600 still was due for the engine, while the volunteers were paying interest on the debt plus the rent for the firehouse out of their own pockets. Cataract was about to be sold and the company reformed as hook and ladder. "But at last we see a glimmer of light," promised the paper. "The ladies, (Heaven bless them!) are coming to the rescue." And somehow, they did. In July, 1864 the engine was paid off AND a new firehouse was built with the parcel owned by the company. There was a ceremony and afterwards "the 'boys' then entertained those present with some tall 'playing' from the machine," which can be left to Gentle Reader's imagination. The 1864 celebration at the new firehouse neatly ends the first chapter of the Santa Rosa Fire Department's story, albeit with large gaps. There are no photos of our "fire laddies" or the Cataract, although it's probably safe to assume it was a twin to the engine shown in the photograph above. Maps are scarce for that era so I can't find the whereabouts of the first firehouse nor the 1864 one - although some digging at the Recorder's office could probably determine that location since the trustees owned the building. And we'll probably never know how "the ladies" - with some unspecified aid from Otho Hinton - managed to quickly raise a great deal of money. The first county history stated there was "a fair and a festival" but if such events were mentioned in the newspaper they were small and easy to overlook. Afte all, space was needed to reassure Santa Rosa the war was going really great for the Confederacy. Ten years later in 1874, the town's firefighting force doubled with the formation of Eureka Hose Company No. 1. This was a hook & ladder company despite the misleading name (some modern historians have mistakenly thought these were two different companies). Their horse-drawn wagon carried ladders, obviously, along with the hooks, which were long wooden pikes with a cast iron hook at the end to yank down walls or roofing in order to allow water to reach hotspots. 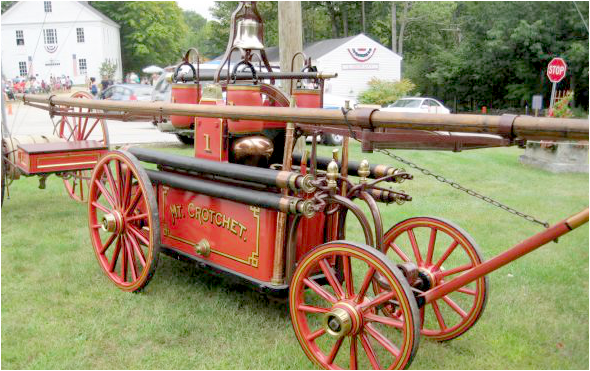 These hook & ladder trucks are best viewed as a kind of giant fireman's toolbox; they also carried buckets, spare hose, parts for emergency engine repair and possibly some basic first aid and rescue equipment - some East Coast trucks even included stretchers. And most important of all, the new company added about two dozen fresh pairs of arms to pump away on the Cataract's brakes. Ten years after that in 1884, we can say SRFD's wild 'n' wooly days were finally over. The firemen were still all volunteers, but the town provided them with a firehouse on Hinton Avenue, across from the soon-to-be-built courthouse in the square. The door to the north was for the engine company with a separate hook & ladder door next to it. 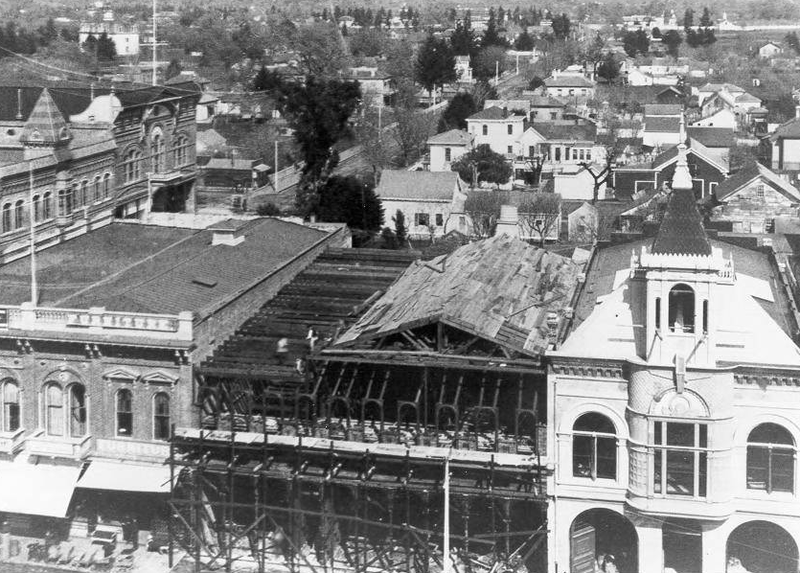 On the second floor, better seen in the bird's eye view below, was Santa Rosa's city hall and first public library combined. IT MUST BE HAD.--We must have some kind of fire organization. Santa Rosa is composed almost entirely of wooden buildings, and if a fire should break out in any part of the town, in all probability the whole place would be laid in ashes. We learn there has been an attempt made to organize a fire department here, but failed for want of the "one thing needful." People have an exaggerated idea, as a general thing, of the cost of forming such an association. We think it would be best to have an engine, but as that would involve considerable expense--and some of our citizens would rather take the chances of losing all they have, by fire, than pay fifty or one hundred dollars toward buying an apparatus that might be the means of saving them several thousand, we propose that they organize a Hook and Ladder Company, the expense of which would be trifling, in comparison with the good that might be effected thereby. This matter must be acted upon, and promptly, too. We are not, personally, so much interested in the matter as are a great many other of our citizens, but are ready and willing to put the ball in motion, and hope all will give it a push. On Tuesday morning last, about 10 o'clock, our citizens were suddenly called into the streets by the fearful cry of "fire." We dropped our "stick," seized a bucket and hurried to the place of alarm, where we found, as might naturally be supposed, the wildest excitement; for although our citizens will not need heed the old adage, "In time of peace prepare for war," when the enemy is upon us they try to meet him to the best of their ability. The fire on Tuesday, proceeded from a frame building on the corner of Main and Second streets, owned by a colored man, named John Richards, part of which is occupied as a barber shop. The room adjoining the shop is a bedroom, and a little girl, three years old, the child of one of the occupants of the house, was alone in the room at the time the fire broke out. A box of matches had been left on a table close to the bed where the child was, and it is supposed that the little one in attempting to light a match, set fire to some articles of clothing, which were on the table, and it was soon communicated to the canvas ceiling. The child ran out of the room, screaming, which alarmed the inmates of the house--and on entering the room to see what was the matter, Richards found almost the entire ceiling in flames. He immediately commenced tearing down the canvas, and that together with the force-pump and hose, of Mr. Colgan of the Santa Rosa House, soon extinguished the flames. We could call the attention of those who have ridiculed the idea of having a Fire Engine in this place to the service rendered by the hose of Mr. Colgan, on Tuesday. No particular damage was done to the house, but Richards had his hands badly burned in tearing his hands badly burned in tearing the canvas from the ceiling. "IN TIME OF PEACE, PREPARE FOR WAR." --We have several times urged upon our citizens the importance of having some kind of organization to protect our town against fire, and as we have just had another narrow escape from the dangerous enemy, we make one more appeal. Give us something; if the citizens do not feel able to buy an engine, let there be a Hook and Ladder Company organized at once. The cost would be but a trifle in comparison with the good that might arise from such an organization. Almost every one we have conversed with on the subject favors it, and we sincerely hope some of our merchants will call a meeting of the citizens, and do something for the protection of their property. A destructive fire occurred in our town on Monday last. About eleven o'clock A. M., we heard the thrilling cry, and on going to the street, found it was only three doors from us, on Third street, and the residence of Dr. S. S. Todd. As near as can be learned, the following are the particulars of the origin of the fire: Mrs. Todd had stepped out to a neighbors, leaving two children, one about four years and the other eighteen months old, in the house, the older of whom states, that his little brother took a piece of paper, lit it, and set a pile of newspapers on fire, that was in a corner of the room. The house being lined with canvas, the flames spread instantaneously, and in a moment the smoke was seen issuing from the windows and roof. Messrs. J. B. Caldwell and Chas. G. Ames were the first to reach the building, and on entering it, the latter found the oldest child trying to open the front door. Mr. Caldwell, supposing that there was no one in the house, was on the point of leaving it with a piece of furniture, when he discovered the younger child standing in a corner, apparently unconscious of danger. The flames spread so rapidly that it was impossible to save much of the furniture. Dr. Todd informs us that he lost, also, a quantity of silver plate, which was, however, recovered after the fire, in the shape of "nuggets." He estimates his loss at seven or eight hundred dollars. The building, which was completely burned, was owned by J. Ridgeway, [sic] and valued at one thousand dollars. No insurance. After the rescue of the children, our citizens turned their attention to saving the adjoining building, part of which was occupied as a residence by Joel Miller, Esq.--and the other part by the DEMOCRAT establishment. There was a space of about thirty feet between the burning house and the residence of Mr. Miller, and but for the superhuman efforts of our citizens, the whole building must have consumed. [sic] Men mounted the roof, and with the aid of blankets and buckets, succeeded in preventing the house taking fire. There was, fortunately, but little wind at the time. Mr. Miller's furniture was all moved to the street, as well as the contents of our office. HOOK AND LADDER COMPANY.--We are gratified to know that since the fire on Monday, our citizens are beginning to manifest an interest in the organization of a fire company. Dr. W. G. Alban has taken the matter in hand, and has already over three hundred dollars subscribed for the purpose. We hope every citizen will lend a helping hand. Much has been said as to the policy of procuring an engine or hooks and ladders. We do not profess to be much of a fireman, and the little experience we have had was with an engine company. But in few of the great scarcity of water and the enormous cost of a fire engine and sufficient hose to answer the purpose in our case, we think it far better to organized a Hook and Ladder Company. Something must be done at once to protect us from the dangerous element, and hooks and ladders with a truck can be procured at about half the expense of an engine. We are requested to state that there will be a meeting at the Court House on Saturday night, at which time a report will be made of the money subscribed, and steps taken to effect the organization immediately. We trust every property holder will be in attendance. FIRE ENGINE.--At the meeting of the Santa Rosa Fire Company, Thursday evening last, arrangements were made for the purchase of a Fire-engine. A committee was appointed, who will purchase "der masheen" as soon as possible. FIRE MATTERS.--The fire engine just purchased by the new fire company at Santa Rosa, is expected to arrive this week or the first of next week. It was built by Hunneman, the celebrated builder of fire engines, and was purchased by Mr. Frank Whitney, ex-Chief of the San Francisco Fire Department. The engine has "seen service" in the East, but not enough to injure it; indeed, it is in such good condition, that competent judges pronounce it to be "as good as new." FIRE MATTERS.--Santa Rosa Engine, No. 1, received their new (in one sense) machine on--that is to say, it came--Sunday last, together with three hundred and fifty feet of hose. The "boys" tried her on Monday afternoon, and rendered a verdict in consequence in perfect accordance with her name--"Cataract. "..At a meeting of the Company, on Monday night, Andrew Ester was elected 2d Assistant Foreman..An adjourned meeting of the Company will be held in the room adjoining "Fen's Saloon," on Saturday evening next, at 1 o'clock, which every member is expected to attend, as very important business will be transacted. RALLY, PUMPS AND HOSE!--The first Annual Ball of the Santa Rosa Engine Company, it should be remembered, will take place on Wednesday next. We bespeak for those who may attend a pleasant time, as the company have made ample preparations to secure the desirable end. The profits of the occasion are to go toward paying for the engine. Let those who delight to "trip the fantastic toe" turn out generally. The supper will be gotten up by Mr. VanDoren of the Eureka Hotel. GOES TO THE FAIR.--Santa Rosa Engine, No. 1--the "bully Cataract"--left town of Tuesday morning for Sonoma, to compete for a prize offered for the best working and worked engine by the Sonoma and Napa county Agricultural and Mechanical Society. Notwithstanding our machine is of much less capacity than any engine in the district, we hope she will meet some competitors, even should she not carry off the prize. But nevertheless, our boys are heavy on the muscle, and go to win. LET THEM CLIMB!--Our fire laddies are soon to be the recipients of an appropriate and useful present, from a citizen of Sonoma. Mr. Anthony Krippenstapel, an exceedingly ingenius [sic] workman, has spent much time in constructing for them a fireman's ladder, which will be formally presented to the company on next Saturday evening. It is twenty feet in length, and every joint is fitted in the neatest and most exact manner; the material has been thoroughly seasoned, and while the ladder is sufficiently strong to support any weight that may ever be put upon it, yet it is so light that it can be handled with ease by one individual. We remember at the time of the burning of the Eureka hotel, such a ladder as this would have rendered material assistance to our firemen, and we doubt not this donation from Mr. Krippenstapel will be properly appreciated by the department. But at last we see a glimmer of light. The ladies, (Heaven bless them!) are coming to the rescue. It has been stated that the Engine is to be sold, and the ladies have determined, if within their power, (and what is it they cannot accomplish?) to save our town from the disgrace attendant upon such an event. They propose by means of a series of entertainments, of their own getting up, to assist in relieving the Department of the incumberances hanging over it. If the property holders will pay the $600 due upon the Engine they will provide the Company with a house, and thereby place the Department upon a permanent footing. If it is desired that the Engine shall remain here something must be done at once. Gen. Hinton, we are pleased to see, has taken the matter in hand, and we hope soon to hear of a response on the part of our "substantial" citizens to the proposition of the ladies. Last Saturday afternoon the new Engine House, built by the ladies of Santa Rosa, was formally presented to the Fire Department, with all the necessary title, papers to property, etc. The Company, in uniform, appeared before the house with their Engine duly decorated at 3 o'clock P. M. The house being well filled with the citizens of the town who had contributed so liberally to the enterprise. On behalf of the ladies, Gen. O. Hinton in appropriate and pleasing remarks passed over the property to the Trustees of the Department. On behalf of the Fire Department, Mr. P. B. Hood made a well termed speech in response to the General, after which cheers were given by the firemen for the ladies, the General and the citizens, and the assemblage were invited to partake of refreshments which had been prepared in the new meeting room by the firemen. The "boys" then entertained those present with some tall "playing" from the machine, and she was duly housed in her new quarters amid the cheers and applause of her members. The ladies have also ordered for the Department new leather hose, which unfortunately, did not arrive in time be presented with the house on Saturday. It will, however, be on hand in a few days, and then we can boast that we have as good Engine, house, hose, and Company, as complete in all their fixtures as may be found without the city of Frisco. Our boys are proud of their Company and well they may be. ENGINE COMPANY NO. 1--The fire which occurred on Monday night called out the fire company in full force. After the excitement was over many reminiscences were brought up by the old members, and on many points a variety of opinions existed. To refresh certain memories it may not be uninteresting to state that the first meeting for the organization of a fire company was held in the upper story of the brick building now used by Stanley & Thompson as a workshop over what was then known as Fen's Saloon. It was held on the 2d of February, 1861, and was organized by electing W. H. Crowell President and Thos. L. Thompson Secretary. It was then determined to start as a hook and ladder company. That meeting adjourned for one week. They met again on the 19th of February, 1861, and elected permanent officers as follows...At a meeting held in March 9, 1861, a committee which had previously been appointed to inquire into the cost of apparatus reported that it would cost from $1,200 to $1,500. It was then thought advisable to change from a hook and ladder to an engine company. On the 7th of November, 1861, Thos. L. Thompson, John S. Van Doren and B. Marks, were appointed as a committee to go to San Francisco and negotiate for an engine. The engine was purchased for the sum of $1,350, $400 of which was paid down, and J.P. Clark, B. Marks and A. Bromberger became responsible for the balance, $900. It was then that the ladies of Santa Rosa came to the relief of the company and by a succession of entertainments, fairs, festivals, etc., rendered the company very efficient aid in freeing itself from debt. About this time application was made to Gen. Otho Hinton to devise some plan whereby the company could extricate itself from debt. He took a lively interest in the matter and his personal efforts in its behalf and good counsels enabled the company not only to free itself from debt but to furnish besides a good and substantial engine house, which afterwards sold for $600. On account of his efforts in their behalf his memory is today highly revered by all the old members of the company, and they still keep his portrait hanging in their hall as a mark of the esteem in which he was held. This is an accurate account of the early days of Santa Rosa Engine Company No. 1, which still exists with the motto adopted in its infancy, "Faithful and Fearless" and which it carries out whenever occasion demands. On last Wednesday morning at about one o'clock an alarm of fire roused our citizens from their slumbers. Our reporter, with his usual fiendishness, saw a large blaze in the northwestern part of the city, and tumbling rapidly into his trousers and getting downstairs in the same dignified manner, sallied forth to do honor to his record as a fireman and to his name as a member of the press. Falling over two dogs and gouging out one of his remaining teeth against a picket fence, he rapidly approached the scene of the now raging fire. The burning building was a two-story dwelling house belonging to Guy E. Grosse, situated on the northwest corner of Tenth street and the Healdsburg road. After getting out of the ditch into which he had by some means found refuge, our man took in the situation. A few small boys were gazing at the flames, which were bursting out of every room. In a short time a number of citizens arrived and before a gret while both branches of the fire department were on the grounds. Nothing could be done to stop the flames, which by this time were rapidly consuming the whole building. After some preliminary tactics, a ten-foot stream was thrown onto the porch in front of the dwelling, which in the course of twenty minutes, by the judicious maneuverings of the heads of the two companies, was so augmented that a very respectable stream of the aqueous element could be forced right and left into the crowds of lookers on. Our man succeeded as usual in spoiling a seven-dollar hand-me-down suit of clothes. During the pyrotechnic display, which by the way lasted for an hour, the ceremony was diversified by the falling of two lofty chimneys--one of which came near ending the days of a telegraphically inclined ex-secretary of one of the organizations; had it not been for the agility displayed by him in talking to the "red-shirts," he would probably have been crushed into an unrecognizable mass of saur-kraut. Among the ludicrous scenes which transpired during the evening, there were some of another nature worthy of mention. The way in which Messrs. Ed. Nagle and Louis Keser fought the flames, after the tardy arrival of the water, was praiseworthy indeed. They did good service, and were it not for the headway gained by the flames, might have prevented a very serious conflagration. Speaking of bravery, we noticed a Republican reporter doing good work on the corner of Tenth and A streets, nobly saving his hands from the fury etc., by keeping them in his pocket. The course of an hour saw the building a mass of cinders. It was an old house, but had been lately repaired by the owner in a substantial manner; a fine outbuilding had been erected, the main structure hard-finished and painted and was about ready for occupancy. Strong suspicions of incendiarism are indulged in regarding the origin of the fire...As it was unoccupied it was undoubtly [sic] set on fire by some of the tramps who of late have invested our city to an alarming extent. It is announced on good authority that before long Santa Rosa will possess a "City Hall" with all necessary offices and departments for the accommodation of the city officials and the transaction of necessary business. Roomy and convenient quarters for the Fire Company and their engine and paraphernalia will also be provided in the building. The project has not yet been made a matter of record in the proceedings of the Common Council, the arrangement having been made somewhat informally. Col. Mark L. McDonald, not long since, purchased a lot lying east of the plaza upon which one of the China houses now stands. This he proposed to tear down and erect a building in its stead, the understanding being that the city authorities will take it off his hands as soon as sufficient money accrues from the tax levy to enable them to do so. The execution of this project will serve a double purpose, not only providing our city with fitting and needed accommodations, but also doing away with the miniature "China Town" east of the plaza, and redeeming what should be one of the choicest locations within the town limits.